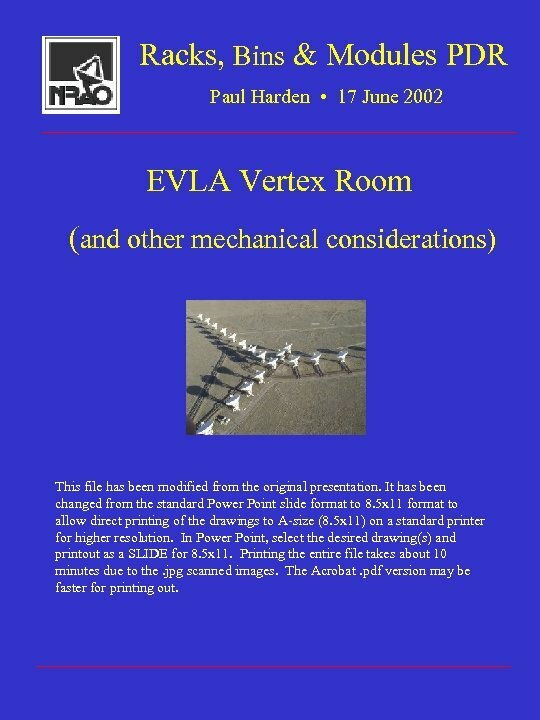 Racks, Bins & Modules PDR Paul Harden • 17 June 2002 EVLA Vertex Room (and other mechanical considerations) This file has been modified from the original presentation. It has been changed from the standard Power Point slide format to 8. 5 x 11 format to allow direct printing of the drawings to A-size (8. 5 x 11) on a standard printer for higher resolution. In Power Point, select the desired drawing(s) and printout as a SLIDE for 8. 5 x 11. Printing the entire file takes about 10 minutes due to the. jpg scanned images. The Acrobat. pdf version may be faster for printing out. Fig. 1 – VLA Antenna Fig. 1 shows the major antenna elements of a typical VLA antenna. 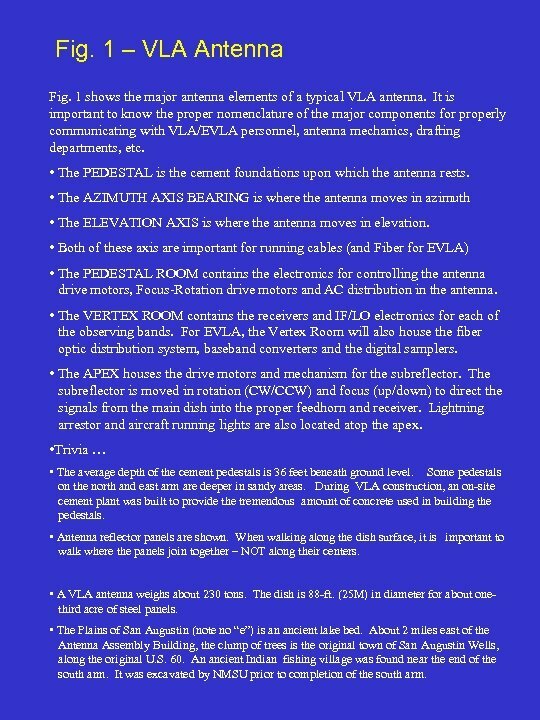 It is important to know the proper nomenclature of the major components for properly communicating with VLA/EVLA personnel, antenna mechanics, drafting departments, etc. • The PEDESTAL is the cement foundations upon which the antenna rests. • The AZIMUTH AXIS BEARING is where the antenna moves in azimuth • The ELEVATION AXIS is where the antenna moves in elevation. • Both of these axis are important for running cables (and Fiber for EVLA) • The PEDESTAL ROOM contains the electronics for controlling the antenna drive motors, Focus-Rotation drive motors and AC distribution in the antenna. 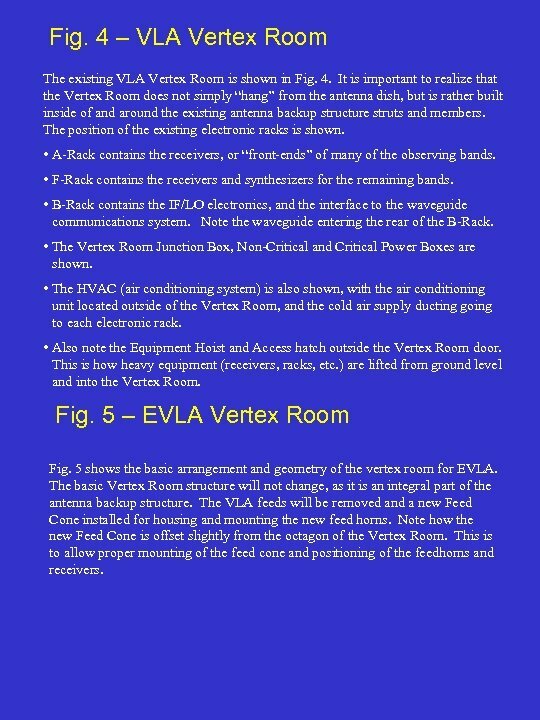 • The VERTEX ROOM contains the receivers and IF/LO electronics for each of the observing bands. For EVLA, the Vertex Room will also house the fiber optic distribution system, baseband converters and the digital samplers. • The APEX houses the drive motors and mechanism for the subreflector. The subreflector is moved in rotation (CW/CCW) and focus (up/down) to direct the signals from the main dish into the proper feedhorn and receiver. Lightning arrestor and aircraft running lights are also located atop the apex. • Trivia … • The average depth of the cement pedestals is 36 feet beneath ground level. Some pedestals on the north and east arm are deeper in sandy areas. During VLA construction, an on-site cement plant was built to provide the tremendous amount of concrete used in building the pedestals. 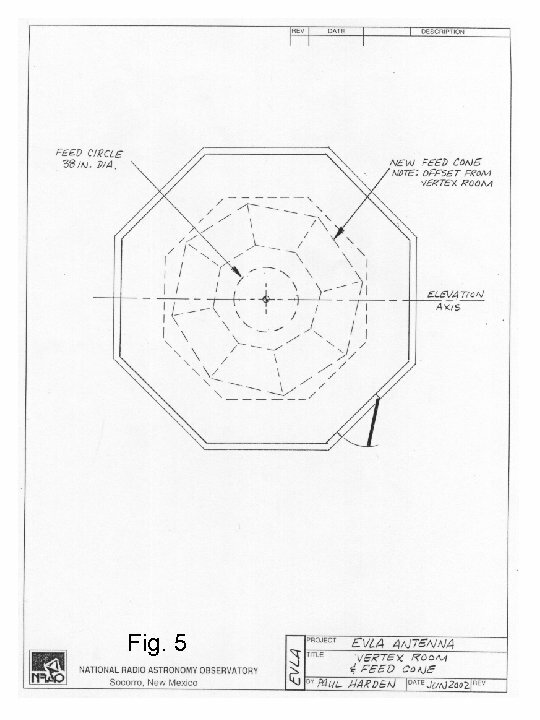 • Antenna reflector panels are shown. When walking along the dish surface, it is important to walk where the panels join together – NOT along their centers. 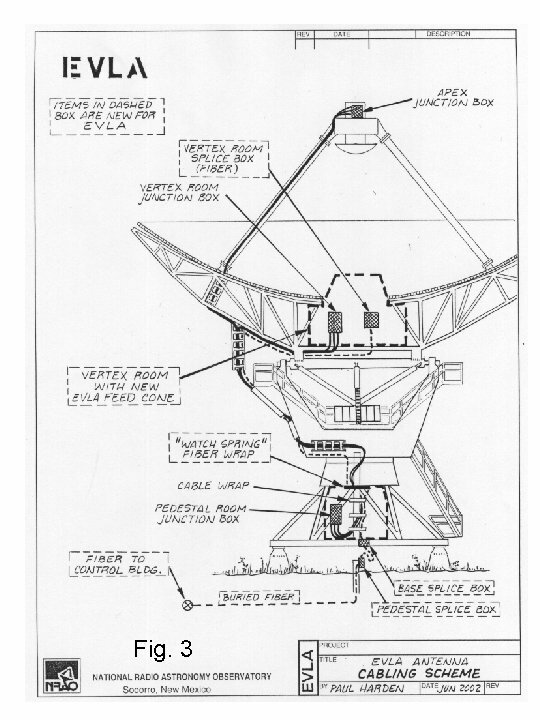 • A VLA antenna weighs about 230 tons. The dish is 88 -ft. (25 M) in diameter for about onethird acre of steel panels. • The Plains of San Augustin (note no “e”) is an ancient lake bed. About 2 miles east of the Antenna Assembly Building, the clump of trees is the original town of San Augustin Wells, along the original U. S. 60. An ancient Indian fishing village was found near the end of the south arm. It was excavated by NMSU prior to completion of the south arm. Fig. 2 – Cabling Scheme – VLA Fig. 2 shows the cabling scheme for the existing VLA antennas. All AC power , antenna and F-R motor drive cables, and other signals, are routed from the Pedestal Room to the Vertex Room or Apex via the AZIMUTH CABLE WRAP. This allows the cables to safely twist and flex as the antenna turns in azimuth. The cables also bend at the elevation axis. All cables run between junction boxes, such as from the Pedestal Room Junction Box to the Vertex Room Junction Box. In addition to providing an orderly cable breakout, these junction boxes also contain the gas discharge devices to protect the cabling from antenna lightning strikes. 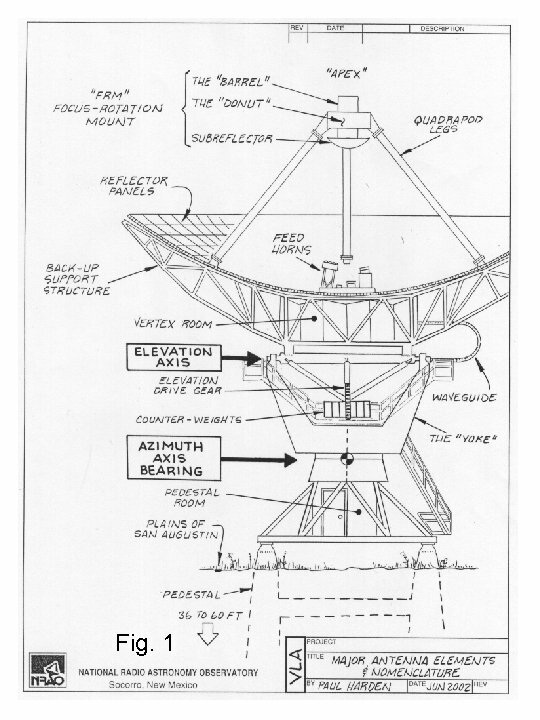 Communications to and from the antennas in the VLA is conducted along the buried waveguide. The waveguide is a single run along each arm, with a waveguide coupler at each pedestal. 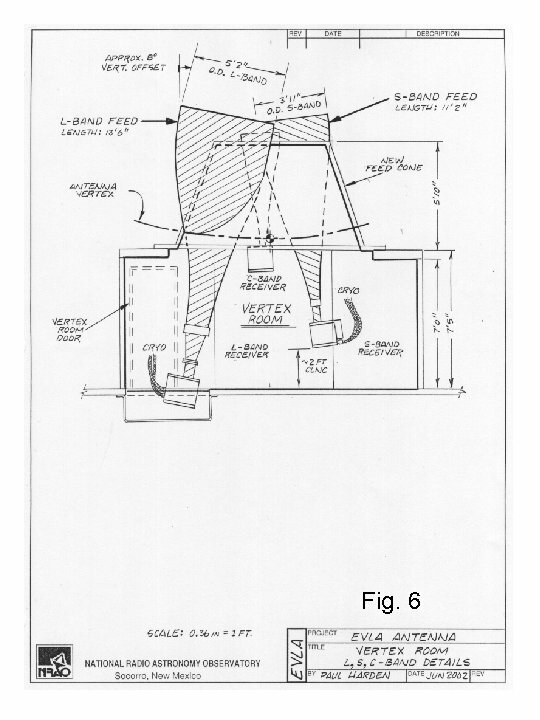 The waveguide enters the antenna at the bottom and into the Pedestal Room, through the yoke and into the IF/LO B-Rack in the Vertex Room. Rotary joints are provided at the Azimuth and Elevation axis. Fig. 3 – Cabling Scheme - EVLA Fig. 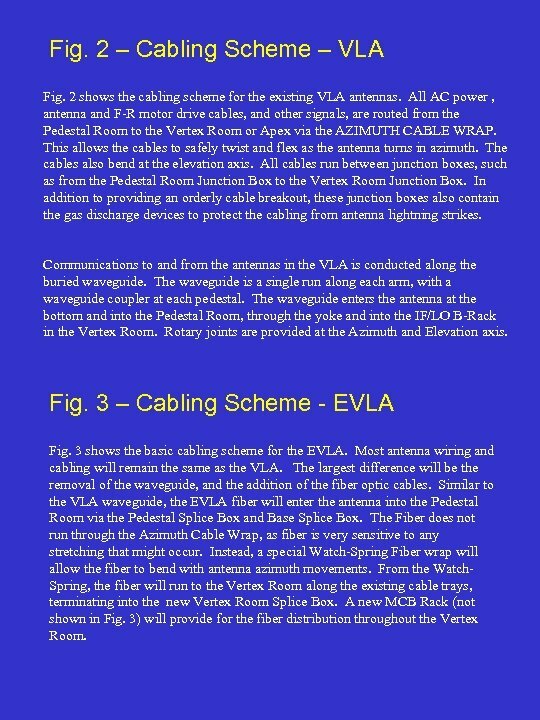 3 shows the basic cabling scheme for the EVLA. Most antenna wiring and cabling will remain the same as the VLA. The largest difference will be the removal of the waveguide, and the addition of the fiber optic cables. Similar to the VLA waveguide, the EVLA fiber will enter the antenna into the Pedestal Room via the Pedestal Splice Box and Base Splice Box. The Fiber does not run through the Azimuth Cable Wrap, as fiber is very sensitive to any stretching that might occur. Instead, a special Watch-Spring Fiber wrap will allow the fiber to bend with antenna azimuth movements. From the Watch. Spring, the fiber will run to the Vertex Room along the existing cable trays, terminating into the new Vertex Room Splice Box. A new MCB Rack (not shown in Fig. 3) will provide for the fiber distribution throughout the Vertex Room. Fig. 4 – VLA Vertex Room The existing VLA Vertex Room is shown in Fig. 4. It is important to realize that the Vertex Room does not simply “hang” from the antenna dish, but is rather built inside of and around the existing antenna backup structure struts and members. The position of the existing electronic racks is shown. • A-Rack contains the receivers, or “front-ends” of many of the observing bands. • F-Rack contains the receivers and synthesizers for the remaining bands. • B-Rack contains the IF/LO electronics, and the interface to the waveguide communications system. Note the waveguide entering the rear of the B-Rack. • The Vertex Room Junction Box, Non-Critical and Critical Power Boxes are shown. • The HVAC (air conditioning system) is also shown, with the air conditioning unit located outside of the Vertex Room, and the cold air supply ducting going to each electronic rack. 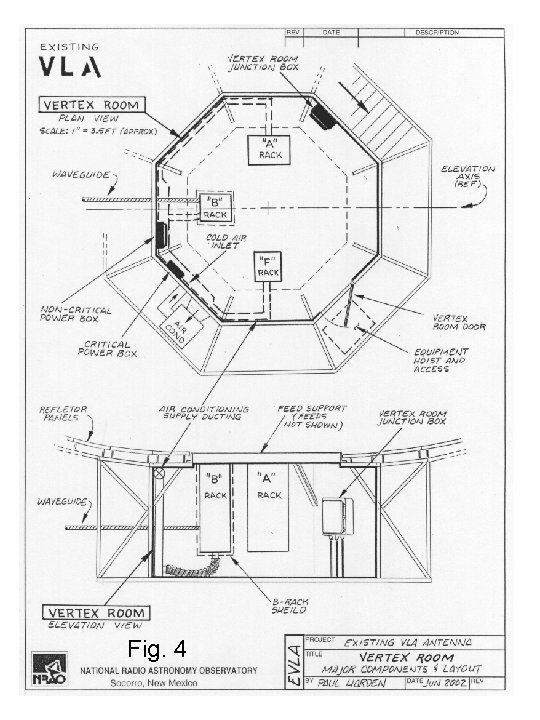 • Also note the Equipment Hoist and Access hatch outside the Vertex Room door. This is how heavy equipment (receivers, racks, etc. ) are lifted from ground level and into the Vertex Room. Fig. 5 – EVLA Vertex Room Fig. 5 shows the basic arrangement and geometry of the vertex room for EVLA. 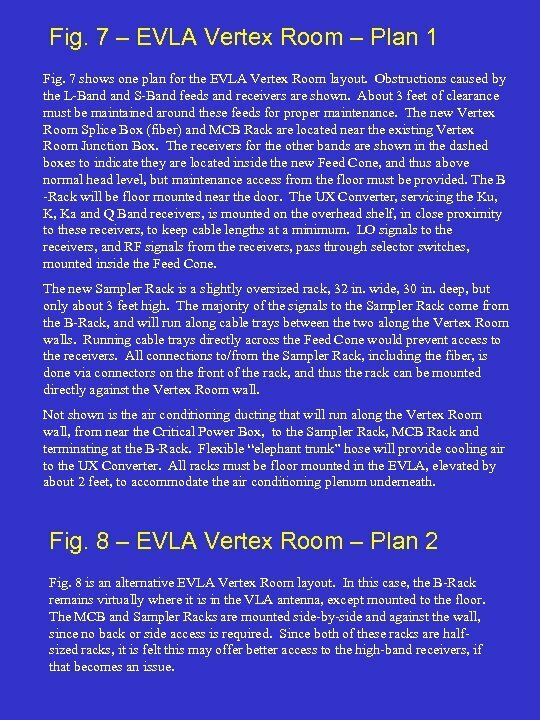 The basic Vertex Room structure will not change, as it is an integral part of the antenna backup structure. The VLA feeds will be removed and a new Feed Cone installed for housing and mounting the new feed horns. Note how the new Feed Cone is offset slightly from the octagon of the Vertex Room. This is to allow proper mounting of the feed cone and positioning of the feedhorns and receivers. Fig. 6 – EVLA Vertex Room Feeds The lower band feedhorns will be significantly larger than the existing VLA feedhorns in order to accommodate the wider bandwidths of the EVLA, as shown in Fig. 6. Of particular interest is the L-band feed (1 -2 GHz) with a new total length of over 13 feet. This will require the L-Band Receiver to be located underneath the Vertex Room floor. A hole in the floor, covered with a grate, will be provided to accommodate this. The S-Band (2 -4 GHz) feed and receiver also consumes considerable space. The C-Band (4 -8 GHz) Receiver will be mounted near the overhead, at about 6. 5 feet high, for normal headroom. These clearances are important for determining the locations of other equipment. The hatched areas in Fig. 7 show the approximate obstructions due to the L and S-Band feeds and receivers. At the time of the Bins and Module PDR, it is not yet known how long the transition pieces on the L and S band waveguides will be. These are the pieces that connect the receivers to the feedhorns, and can vary from about 1 to 3 feet in length. 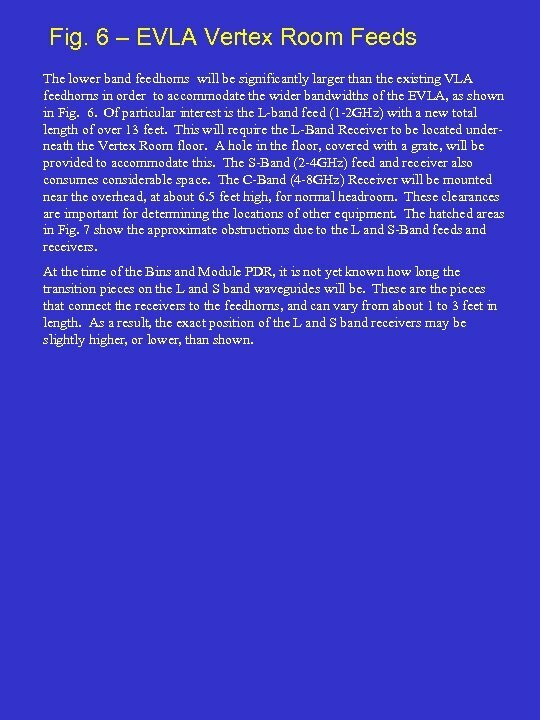 As a result, the exact position of the L and S band receivers may be slightly higher, or lower, than shown. Fig. 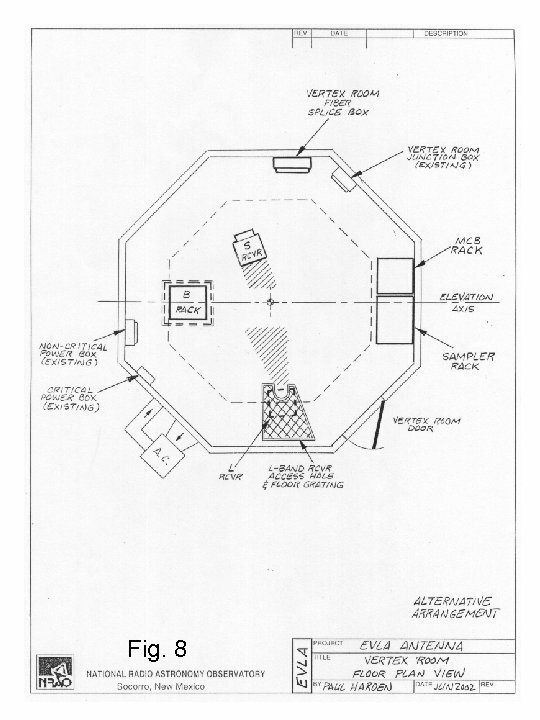 7 – EVLA Vertex Room – Plan 1 Fig. 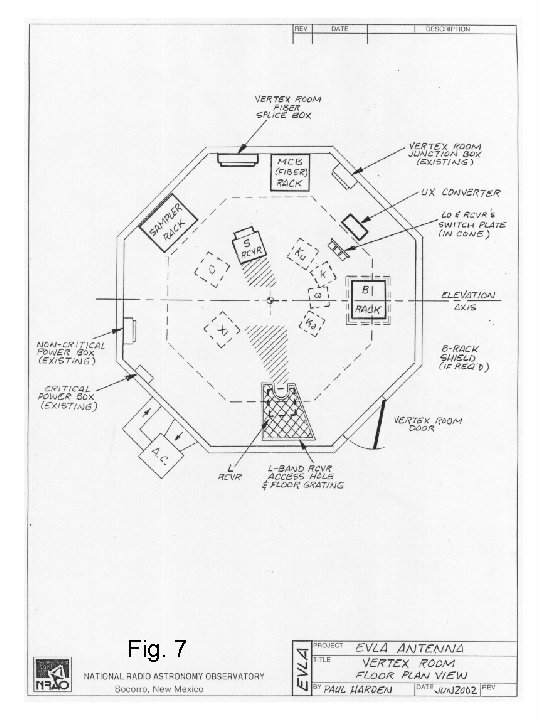 7 shows one plan for the EVLA Vertex Room layout. Obstructions caused by the L-Band S-Band feeds and receivers are shown. About 3 feet of clearance must be maintained around these feeds for proper maintenance. The new Vertex Room Splice Box (fiber) and MCB Rack are located near the existing Vertex Room Junction Box. The receivers for the other bands are shown in the dashed boxes to indicate they are located inside the new Feed Cone, and thus above normal head level, but maintenance access from the floor must be provided. The B -Rack will be floor mounted near the door. The UX Converter, servicing the Ku, K, Ka and Q Band receivers, is mounted on the overhead shelf, in close proximity to these receivers, to keep cable lengths at a minimum. LO signals to the receivers, and RF signals from the receivers, pass through selector switches, mounted inside the Feed Cone. The new Sampler Rack is a slightly oversized rack, 32 in. wide, 30 in. deep, but only about 3 feet high. The majority of the signals to the Sampler Rack come from the B-Rack, and will run along cable trays between the two along the Vertex Room walls. Running cable trays directly across the Feed Cone would prevent access to the receivers. All connections to/from the Sampler Rack, including the fiber, is done via connectors on the front of the rack, and thus the rack can be mounted directly against the Vertex Room wall. Not shown is the air conditioning ducting that will run along the Vertex Room wall, from near the Critical Power Box, to the Sampler Rack, MCB Rack and terminating at the B-Rack. Flexible “elephant trunk” hose will provide cooling air to the UX Converter. All racks must be floor mounted in the EVLA, elevated by about 2 feet, to accommodate the air conditioning plenum underneath. Fig. 8 – EVLA Vertex Room – Plan 2 Fig. 8 is an alternative EVLA Vertex Room layout. 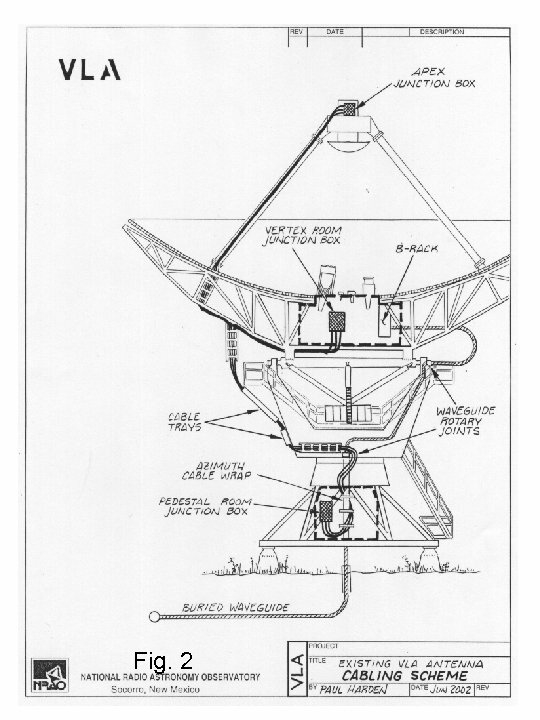 In this case, the B-Rack remains virtually where it is in the VLA antenna, except mounted to the floor. The MCB and Sampler Racks are mounted side-by-side and against the wall, since no back or side access is required. Since both of these racks are halfsized racks, it is felt this may offer better access to the high-band receivers, if that becomes an issue.